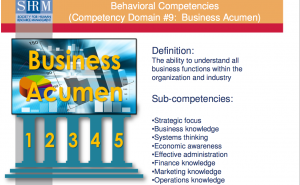 SHRM considers business acumen important for HR business partners. Are you accumulating “business acumen”? We come across the term more and more often in business articles about searching for and developing top talent. If it is becoming a popular metric for assessing employee talent and potential, then you should be aware of it and what it takes to get it. 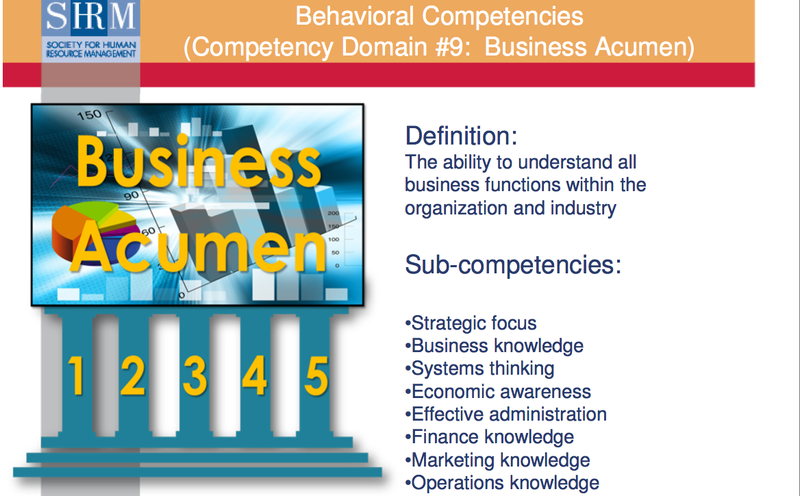 Of course, “acumen” is another way of saying “knows the business,” with an emphasis on financial matters. In short, what drives the revenues and expenses of the organization? How does your work impact the financial structure? Here is the good news: An engaged employee naturally acquires business acumen because he or she is curious about the whole organization, not just their little corner of it. To be properly engaged in any organization’s mission and work towards achieving it, knowledge about the whole business is critical. Here is a key learning, which smart people throughout any organization know. Accumulating business acumen is the employee’s responsibility as much as it is his or her superiors’. Engagement with the corporate mission is a two-way street. Bosses have to work every day to engage their subordinates, and those employees must reciprocate with energy and effort that is productive in achieving organizational goals. Part of that energy and effort must be dedicated to self-improvement, learning as much as time allows about the rest of the business to put your own efforts in perspective. Get a financial mentor. Build a relationship with corporate financial officers. Follow them around or have several meetings with them to absorb all aspects of the business finance. Circulate and Practice. Broaden your business acumen by moving to other areas of the company. Watch leaders in other functions and study their decisions & actions. Read, Read, Read. Read to better understand today’s business environment, new emerging trends, new technologies, new marketing opportunities, etc. Accumulating business acumen may just be another buzz phrase for “know the business,” but if that is what HR and senior executives are looking for in promising employees, spend some time acquiring it! It fits well with our “Pursuit of Truth” philosophy, too. Have you added financial “literacy” or acumen to your skill set? Do you make an effort to educate yourself on the financial structure of your whole organization, and your unit’s part in that structure? Let us know how you go about that.